Master's students in the School of Education engage in a class discussion. American Univ. The market for new teachers is on the rebound, and there is a critical need for education leaders and policy makers—both nationally and globally. 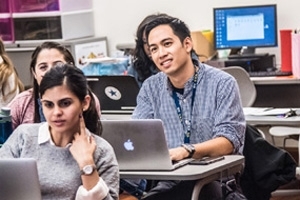 To help meet this demand, American University (AU)'s School of Education today announced the launch of three online graduate programs in education. These innovative online programs will provide future teachers and education leaders access to world-class educator preparation and outstanding faculty regardless of where they live. Unless there are major changes in teacher supply and demand projections, annual teacher shortages could increase to as much as 112,000 teachers by 2018 and stay close to that level in subsequent years, according to a report by nonprofit education research group Learning Policy Institute. Existing teacher shortages in the United States are already having impacts on education, including affecting key subject areas like mathematics, science and special education, the report also notes. "The teaching profession is in need of teachers who are ready on day one. American University is offering top-notch online teacher preparation to help fill the teacher pipeline," said Dr. Cheryl Holcomb-McCoy, dean of AU's School of Education. "It is more important than ever to make graduate education programs accessible to students online so we can prepare the next wave of teachers, policymakers, and leaders." "We are thrilled to partner with American University to increase its suite of outstanding online programs," said John Katzman, founder and CEO of Noodle Partners. "This new partnership will expand access, which is crucial to educating future educators." The content and curricula of the three new online programs replicate the on-campus degree programs that have successfully launched the careers of hundreds of teachers, special education experts, and education policy leaders. The Master of Arts in Teaching prepares novice K-12 teachers for the realities of teaching in all types of classrooms and provides them the knowledge and pedagogical skills needed to ensure classroom and student success. The Master of Education in Education Policy and Leadership prepares education professionals for policy and leadership challenges in changing times. Students work with faculty and education leaders to develop knowledge and skills in leadership, policy, law, economics, and the research needed to effectively administer education programs and policies at all levels. The Master of Arts in Special Education: Learning Disabilities provides teachers with specialized training for teaching students with disabilities. AU's School of Education maintains a unique partnership with The Lab School of Washington, a pioneering, arts-based scholastic day school for students with severe learning disabilities. MA Special Education students receive training and supervision from The Lab School teachers.